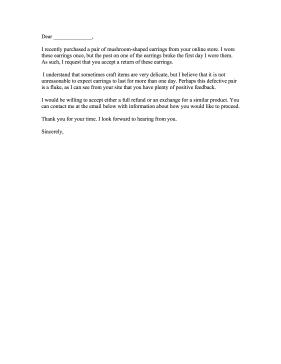 Use this complaint letter as a repair request to an artisan craftsman. I recently purchased a pair of mushroom-shaped earrings from your online store. I wore these earrings once, but the post on one of the earrings broke the first day I wore them. As such, I request that you accept a return of these earrings. I understand that sometimes craft items are very delicate, but I believe that it is not unreasonable to expect earrings to last for more than one day. Perhaps this defective pair is a fluke, as I can see from your site that you have plenty of positive feedback. I would be willing to accept either a full refund or an exchange for a similar product. You can contact me at the email below with information about how you would like to proceed.